Polyurethane is a great choice for protecting electronics subject to changing weather, moisture, dents, vibration or heavy impacts. We can create a unique design for your product – with the help of industrial designers, if required. In addition to polyurethane, electronic measuring devices can be protected by potting, using either epoxy or silicone. In this process, electronics is encased in an open or closed mould. Epoxy potting is used to achieve superb vibration resistance, whereas silicone potting is commonly used in the automotive industry in order to protect electronics from a variety of hazards. 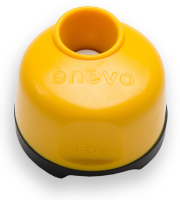 Enevo manufactures waste analytics solutions. At the heart of the solution is a sensor that is installed in every waste container. It monitors the fill level, sending real-time information to the system administrator over a mobile network. The data from the sensors can be used to optimise the emptying frequency and thereby increase the efficiency of waste management. SMH-Uretan contributes to the operation of Enevo’s sensors in this challenging environment by manufacturing the outer casings for the sensors. The polyurethane casing protects the sensitive electronics from changing weather, chemicals, moisture and mechanical stress.